Automatic drip coffee makers are everywhere these days. You can find them practically anywhere if you look hard enough. People love them for a number of reasons, though primarily because they offer speed and convenience when it comes to brewing a cup of coffee. And because of their automatic operations, these coffee makers allow individuals to multitask, pursuing other activities while at the same time brewing a cup of coffee. It is also worth noting that these coffee makers are very affordable. So if you want to get a coffee maker, you might as well start with an automatic drip coffee maker. Now that you know how affordable drip coffee makers are, which one are you going to buy? That question is very difficult to answer because drip coffee makers come in a variety of types, shapes, sizes and brands. As such, selecting one from the masses might prove difficult. This list might simplify things for you, though, because it constitutes the best drip coffee makers you can find on the market today. There are few things about this Cuisinart coffee maker that are worth noting. Consumers will appreciate the fact that it has an ergonomic handle that makes it very comfortable to use. Consumers will also notice the dripless spout and knuckle guard, though the fact that this coffee maker is fully automatic with 24-hour programmability is likely to monopolize most people’s attention. The coffee maker is designed to make things as convenient as possible. There is a Brew Pause’ feature that allows you to enjoy your cup of coffee before it even completes brewing; additionally, the Carafe temperature can be adjusted, switched between high, medium and low settings. As far as coffee makers are concerned, this one is quite decent. There is so much to love about the Hamilton Beach drip coffee maker, from the one-hand dispensing to the fact that you do not have to worry about carafe, pouring or spills; you can also use your favorite ground coffee. There are a variety of brewing options on offer, from regular to bold, iced coffee and small-batch options. The adjustable auto shutoff feature will help with the conservation of energy; there is never a need to break another glass carafe. The first thing you might notice about this coffee maker is the removable water reservoir that makes filling much easier. The machine also has the ability to maintain the temperature of the just-brewed thermal carafe, this ensuring the freshness of the coffee. The water filtration system on offer can eliminate up to 97% of Chlorine which can only improve the flavor of the resulting coffee, this while the Delay Brew Timer’ makes it possible for you to wake up to a fresh cup of coffee by setting the brew time ahead. Along with a two-hour automatic shutoff and a cleaning cycle that sees the coffeemaker clean itself, this is the sort of coffee making system everyone would want as a gift. This pure flavor brewing system has a way of consistently delivering great flavors of coffee from the first drop to the last. Boasting 24-hour programmability and an auto on/off feature, this coffee maker gives you the option of either enjoying your coffee regular or bold, depending on what you like. The display panel is large and easy to read while the control panel is user-friendly and features LED indicators and easy to read buttons. The classic brushed metal design of this coffee maker is complemented by an ergonomic handle that ensures comfort. The coffee maker also has a Brew Pause’ feature that allows you to enjoy your coffee before it is finished brewing. The 24-hour advance brew start is also available, this along with a programmable auto shut off. A charcoal water filter and permanent gold tone filter are availed to ensure hat you only get the freshest coffee flavors possible. This coffee maker can brew an entire pot of coffee in just 3 minutes; that is impressive no matter where you are. The water is always hot and ready to brew coffee at a moment’s notice. A drip-free carafe with a proprietary lid and spout design ensures that you can safely arc your coffee into a cup without any spillage, this while a multi-stream spray head ensures that hot water is evenly showered over the coffee grounds. The bottom filter is large and flat while the funnel is great enough to allow sufficient interaction between hot water and the coffee grounds, this delivering superior a flavor. 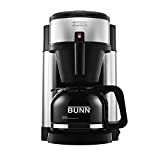 This 65—watt coffee maker can produce up to five cups of coffee; because of the filter cone sitting inside the decanter, it is compact and much easier to use. The water reservoir, it should be noted, is concealed and removable. Consumers will love the automatic keep warm’ function that makes the brewing process much faster. This 1400W heater has the power to raise water to the ideal temperature at a rapid rate, this while ensuring that the water and coffee grounds interact at the most precise moment possible to deliver the best flavor. Additionally, the shower head works to ensure complete saturation and optimal extraction. An auto shut off feature is provided. 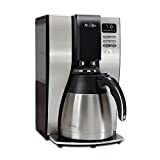 This stainless steel coffee maker is pretty simple in its design, boasting a one-touch brew operation, auto-off function, a precise 1500W heater that maintains water at the perfect brewing temperature, an optional pre-infusion mode that wets freshly roasted ground coffee (allowing degassing before brewing) and a flat-bottomed filter basket. The large showerhead on offer guarantees superior saturation and uniform extraction. Using advanced technology to give you the hottest coffee possible without compromising on flavor, this machine allows consumers to control the brew strength, making it possible to choose between regular and bold flavors. The 24-hour programmability, auto shut-off and adjustable keep warm’ temperature controls are great draws. Why should you suffer with terrible coffee? If you want to enjoy the sweetest cups of coffee around without expending too much energy, you might as well invest in these, the best drip coffee makers around.